Disgraced Chinese Politburo member Bo Xilai has been expelled from the ruling Communist Party and is to face criminal charges - he is accused of abuse of power, bribe-taking and violating party discipline. Following is the official translation of the party statement, translated by state news agency Xinhua. 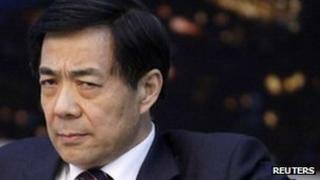 Bo Xilai has been expelled from the Communist Party of China (CPC) and his public office, according to a decision made at a meeting of the Political Bureau of the CPC Central Committee on Friday. The meeting also decided to transfer Bo's suspected law violations and relevant clues to judicial organs. The decisions were made after the meeting deliberating and adopting an investigation report on Bo's severe disciplinary violations submitted by the CPC Central Commission for Discipline Inspection (CCDI). At a meeting held on 10 April, members of the Political Bureau of the CPC Central Committee were briefed on the investigation into the incident of former Chongqing vice-mayor Wang Lijun's entering the US Consulate General in Chengdu without permission, as well as the reinvestigation into the suspected murder of British citizen Neil Heywood by Bogu Kailai, Bo's wife. Based on Bo's mistakes and responsibilities in the two cases and clues to his other discipline violations found in the probe of the two cases, the CPC Central Committee decided to suspend Bo's membership in the CPC Central Committee Political Bureau and in the CPC Central Committee, and the CCDI filed the case for investigation. Investigations found that Bo seriously violated the party disciplines while heading the city of Dalian, Liaoning Province and the Ministry of Commerce, as well as serving as a member of the CPC Central Committee Political Bureau and party chief of Chongqing Municipality. His position was also abused by his wife, Bogu Kailai, to seek profits for others and his family thereby accepted a huge amount of money and property from others. Bo had affairs and maintained improper sexual relationships with a number of women. He was also found to have violated organisational and personnel disciplines and made wrong decisions in personnel promotion, which led to serious consequences. The investigation also found clues to his suspected involvement in other crimes. Bo's behaviours have brought serious consequences, badly undermined the reputation of the party and the country, created very negative impact at home and abroad and significantly damaged the cause of the party and people.